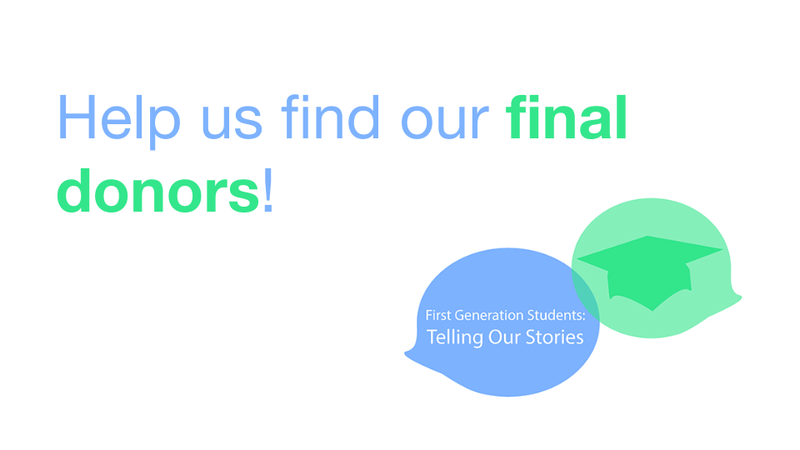 We had a wonderful first week on our First Generation Students: Telling Our Stories. We’ve continued to get donations that represent generosity from a full range of income levels. And now we have only three days to go, and we’re still 20% short of the goal we set after blasting through the first cautious goal that our fund-raising coaches had set for us. We need to have a great three days to be able to launch this project. (Don’t tell our coaches, but we’d love to blast through this new goal too!). Have you been thinking of donating, but just haven’t yet? Now’s the time. I’m thinking, also, that readers of this blog know many people who were First Generation or who support First Generation Students. It would be wonderful if you’d share this link with them. We cannot wait to launch this project. And first, we must raise the funds. Thanks so much for your support and your sharing.